Electric ignition is, perhaps, the 20th century's largest contribution to the field of pyrotechnic ignition. It allows the average pyrotechnist to accurately time the ignition of set pieces, drivers, rockets, etc, in a display, without the need for the dozens of feet of quickmatch that were once nessesary. Also, it allows the firer of fireworks that are potentially hazardous to be much farther away from the respective device than would normally be possible. The basis of elecric igition is the electric match, hereinafter referred to by the common nickname of "e-match". 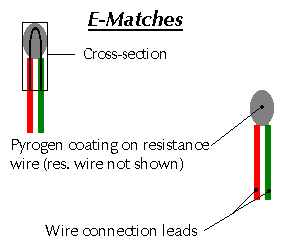 An e-match is basically a length of resistance wire (usually a nichrome filament)that is coated with various pyrogens. This resistance wire is then attatched to sections of insulated copper wire (hereinafter referred to as wire leads). When the e-match is to be fired, the ends of the wire leads are connected to an extension wire, which is switched at one pole and connected to a battery (usually 12v). When the switch is flipped, current travels from the battery which flows to and heats up the resistance wire in the core of the e-match, which then ignites the pyrogen, which in turn ignites the device that it is attatched to. Thanks to the simplicity of the e-match, producing your own e-matches is quite a simple task. If the desire to produce your own e-matches arises, they can be made with the following method. The materials needed to produce an e-match are: nichrome resistance wire (you can remove this from old or cheap hairdriers); a pyrogen; several meters of insulated copper wire; a 12v battery; some 25% conc. NC lacquer; and a 1/8" diameter rod. In this composition, the meal BP serves as a fast-fire composition (to transfer fire quickly throughout the e-match) and a filler (trust me, silicon powder is more expensive than meal BP). The 6% of potassiuum nitrate is added to provide oxygen for the silicon to burn with. The purpose of the silicon is to create a molten slag to assist ignition (this slag is composed of molten glass). The titanium is added to supply hot, penetrating sparks. I suggest you diaper-mix this composition together, as the inclusion of titanium adds to the sensitivity of pyrotechnic compositions. Now that we've got the pyrogen composition mixed, we can go on to complete the e-match. First, cut about 1" of nichrome wire from the main bundle, and put a 180 degree bend in it at the center (bend it into a U-shape), using the 1/8" rod as a guide. With a file, roughen the nichrome wire at the bend, to give the pyrogen something to cling to. Remove the now U-shaped resistance wire from the rod and dip it into some NC lacquer. Before the lacquer dries, dust the coated wire with meal powder (used as a prime). Next, take some of the dry pyrogen composition explained above and mix it with NC lacquer until a thick, kinda sticky dough is obtained. Take some of this and mold it around the meal-coated portion of the e-match, and allow the NC lacquer to dry fully. After this dough has dried onto the resistance wire, give the e-match a final coating of NC lacquer, perhaps using a paintbrush, and allow it to dry. Although this sounds like a complicated process, it is not. Anyone with any experience with pyrotechnics should be able to make an e-match using this process in under 2 minutes (excluding drying time). Next, connect the e-match to some extension wires, and connect the other end of the extension wire to the poles of a 12v battery. The e-match will flare up in a shower of sparks and molten glass globulets. Here is a schematic of an e-match.